Grant, Peter. "Rocky Mountains". The Canadian Encyclopedia, 15 March 2019, Historica Canada. 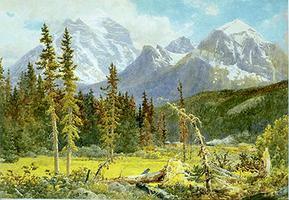 https://www.thecanadianencyclopedia.ca/en/article/rocky-mountains. Accessed 25 April 2019. Castlelike mountain resorts built on the rail line at Banff and Lake Louise have become all-season recreation centres for Banff National Park's (established 1885) many alpine attractions, which attract 4.5 million visitors annually. Lucius O'Brien, 1887, watercolour (courtesy Library and Archives Canada). Rocky Mountain range, BC (courtesy Pat Morrow/First Light Associated Photographers). 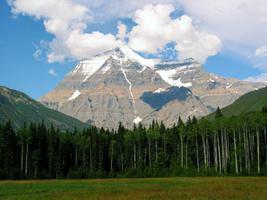 At elevation 3954 metres, Mount Robson is the highest peak in the Rocky Mountains (photo by James Marsh). 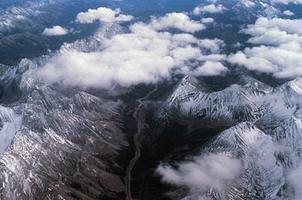 Aerial view of the Rocky Mountain range, BC (photo by Pat Morrow, courtesy First Light Associated Photographers). Glacier National Park, Mount Sir Donald (photo by John Woods). 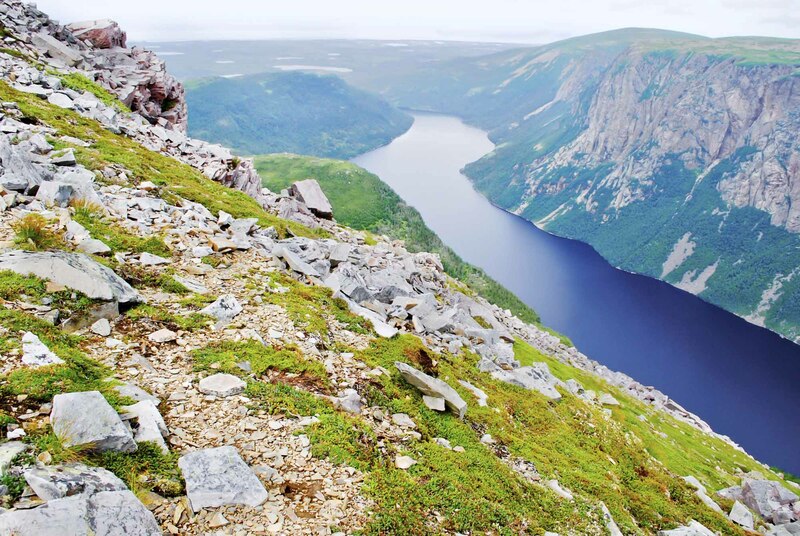 Rocky Mountains, North America's largest mountain system, are widely known for their vistas of spacious subalpine valleys and rugged, exposed rock faces. The Canadian segment of the Rockies extends 1200 km from the American borders of BC and Alberta to the Liard River Basin, flanked on the west by a distinct trench and on the east by rolling foothills. The Canadian Rockies of song, film, painting and postcard, however, are in the Main Ranges, near the rail and highway routes through 2 mountain passes. These and other passes mark the southern boundary between BC and Alberta and mark the Continental Divide, where Pacific watersheds back onto Atlantic and Arctic sources. The human record in the Canadian Rockies is less than 4000 years old. Kootenay and Secwepemc peoples long travelled the southern passes to hunt on the Prairies. European explorers approached by northern routes; Alexander Mackenzie, the first (1793) to cross the Rockies, used the Peace River. On the same route, Simon Fraser established the first Rocky Mountain trading post at Hudson's Hope (1805). Kicking Horse Pass was chosen in 1882 for the Canadian Pacific Railway (CPR) link between the Prairies and coastal BC. Development of the Yellowhead Pass area, southwest of Edmonton, followed the same pattern, adding railway lines (1911, 1915), Jasper National Park (established 1907; 1.8 million visitors annually), the community of Jasper and a resort hotel. Four adjoining national parks (Banff, Jasper, Kootenay and Yoho) form the largest body of mountain parkland in the world. Together these parks were declared a World Heritage Site in 1984. Waterton Lakes National Park and Glacier National Park, Montana, comprise another world heritage site (1995). 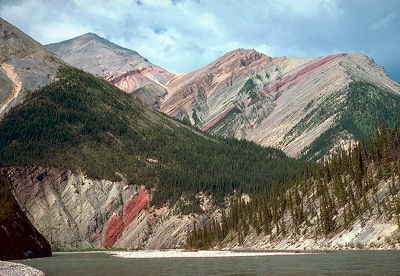 Throughout this area the Rockies form northwest-trending waves of sedimentary rock up-piled by vast thrust faults in the Tertiary age (65-1.65 million years ago) and eroded by glaciers, remnants of which remain. Magnificent mountain forms, commonly higher than 3050 m, include castellate, matterhorn, sawtooth and dipping strata peaks. The highest is Mount Robson. To the south, in the Crowsnest Pass area of the border ranges, a CPR railway line built in 1898 opened Rocky Mountain coal and minerals to underground mine development. Open-pit mines near Sparwood and Elkford, BC, have greatly expanded the area's coal production since the 1960s. The southern Alberta foothills of the Rockies have been a cattle ranching centre since the 1870s. Natural-gas drilling has progressed into foothill country in recent decades. North of the Kakwa River, the Rockies are entirely in BC. 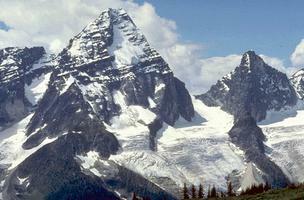 They subside to modest heights (maximum 2542 m) with rounded, often timbered summits and little evidence of glaciation. The forest industry followed highway (1952) and railway (1958) construction northeast from Prince George. 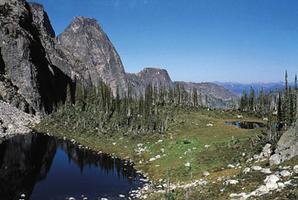 Open-pit coal mines at Quintette and Bullmoose mountains in the BC foothills started in 1983. Closure of the Quintette coal mine in 2000 forced nearly half of the residents of the town of Tumbler Ridge to leave. The higher Muskwa Ranges, north of the Peace River, are penetrated by the Alaska Highway, but remain little developed. Ben Gadd, Handbook of the Canadian Rockies (1986, rev. 1995). Jasper National Park of CanadaThis illustrated Parks Canada website describes the ecology, geography, and history of Jasper National Park of Canada. Atlas of Canada - National ParksThis Atlas of Canada map depicts Canada's national parks and reserves.